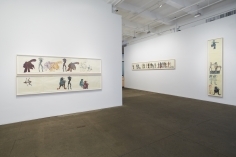 Nancy Spero’s repertoire of female figures run, dance, crawl, tumble, and strut across the page in the exhibition From Victimage to Liberation: Works from the 1980s & 1990s. 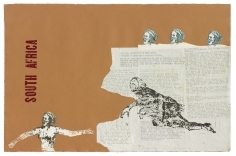 This rarely-seen selection of Spero’s collaged narratives show women transformed from historical contexts of suffering and subordination into protagonists in charge their own destinies. 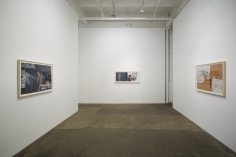 From Victimage to Liberation is the first solo presentation of Spero’s work in New York since her death in 2009. The exhibition will open to the public on January 2, 2013, and the opening reception will follow on January 10, 2013. Much of Spero’s work throughout the 1980s and 1990s demonstrates an optimistic mood through a new embracement of color, humor, and rhythm. 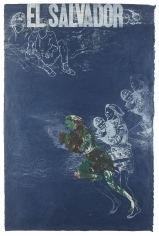 By printing on both connected and continuous long sheets of paper in horizontal and vertical compositions, Spero allowed her figures space for movement and suspension. 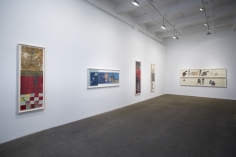 The frieze-like collages evoke filmic motion and fragments of contemporary society, which confirms Spero as major contributor to post-modernism. Her adoption of the zinc plate was also a major breakthrough in her process: she was able to reproduce and reuse images, multiplying the presence of these women and granting a single figure various associations. At the time of her death, she had over four hundred characters in her “stock company” and many of them are included in this exhibition. In Picasso and Fredericks of Hollywood(1990), a group of disparate characters including an abstracted female borrowed from Picasso, a Fredericks of Hollywood lingerie model, a figure drawing by an insane woman, and a Mexican woman giving birth in the presence of the devil, are repeated in different colors and opacities creating a sexually-charged narrative. 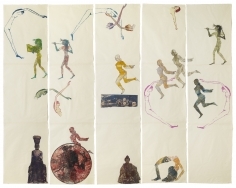 The Goddess Nut II (1990) multi-panel composition celebrates women of ancient cultures such as the Egyptian sky goddess Nut, Egyptian musicians and acrobats, the Phrygian mother goddess Cybele, a mythological Greek Maenad or “raving one”, a princess’s skeleton, and the “running women” who regularly appear in her work. 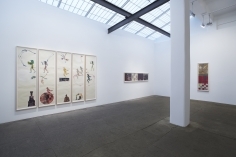 Nancy Spero’s (1926–2009) groundbreaking career spanned more than fifty years. 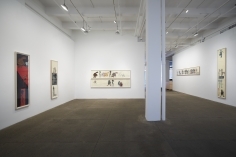 Spero’s best known works include her politically-charged War Series and Artaud Paintings of the late 1960s and early 1970s, and her extensive scroll works such as the Codex Artaud (1971-1972) and Notes in Time on Women (1979). 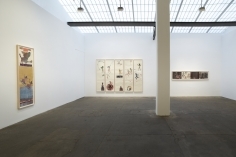 Her installation Maypole/Take No Prisoners was presented at the Venice Biennale in 2007, and her last monumental scroll work Cri du Coeur was shown at the 2010 Bienal of Sao Paolo. 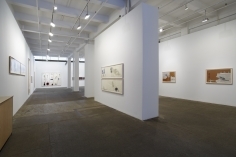 She was also featured in the Gwangju Biennale (2000), Whitney Biennial (1993), and Documenta X (1997). 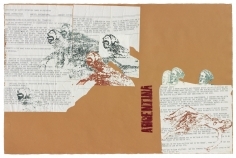 Major monographic exhibitions of Spero’s work have been shown at the Museo d’Art Contemporani de Barcelona; Centro Galego de Arte Contemporanea, Santiago de Compostela, Spain; de Appel Arts Centre, Amsterdam; Institute of Contemporary Art, London; Kunsthalle zu Kiel, Germany; and Museum of Contemporary Art, Chicago. 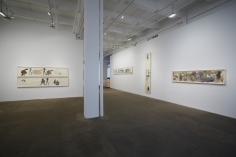 Spero’s most recent retrospective was organized in 2010 by the Centre Georges Pompidou in Paris, and traveled to the Serpentine Gallery in London in March 2011. Kunst Sammlung Nordrhein Westfalen in Dusseldorf, Germany presented her War Series in January 2012. 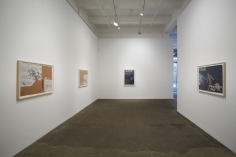 An illustrated catalogue, with an essay by New York Times and ARTnews contributor Hilarie M. Sheets, is published to accompany From Victimage to Liberationand is available for sale at Galerie Lelong.